On the top floor of one of downtown Cairo’s architectural gems, dozens of dedicated fans flocked to celebrate the long journey of their favourite theatre and folk arts troupe, El-Warsha. Founded in 1987 by director Hassan El-Geretly, the troupe has focused on reviving classic gems from folk heritage -- story-telling, sira recitation, stick arts, folk singing and classic musicals. Egypt’s first independent troupe, El-Warsha has featured stars such as actors Ahmed Kamal, Abla Kamel, Sayed Ragab and many more. “In celebration of 30 years of work, we created a hashtag: Hekayat Maa El-Warsha (Stories With El-Warsha) where we invite our audience to share their stories and memories with El-Warsha,” El-Geretly announced at the beginning of the celebration that started with a classic tahteeb (a stick dance, verified by UNESCO as Egypt’s intangible heritage) by internationally acknowledged performers of Markaz Medhat Fawzi for stick arts. Then we were enchanted by the voice of Bassem Wadie, who had joined the troupe as a teenager. He sang a mawal (solo) of a sira as well. 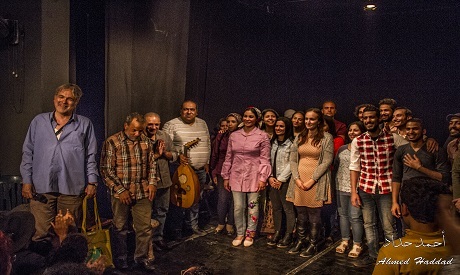 The performance was followed by a few testimonies from the audience, which included renowned publisher Mohamed Hashem and El-Rayes Zakaria, founder of El-Tanboura folk troupe who even performed one of his famous folk pieces in celebration of the event. El yeish yama yeshouf, ("We live to learn") was a classic song that the troupe sang in memory of Hassan Khanoufa, one of the last shadow puppeteers who joined El-Warsha in his old age and created workshops and performances with younger generations. “This is a song about a man who tries working several jobs in street markets, attribute to Hassan Khanoufa,” explained El-Geretly. Then came the story-telling; story-teller Mohamed Shokry told a story written by well-known author Ibrahim Aslan about a taxi driver’s journey to renew his driving licence. Then Mido sang one of the famous political songs of the sixties, Valery Giscar d'Estan, with lyrics by Ahmed Fouad Negm and music by Sheikh Imam. The satirical song, named after the French president of the day, mocked the French and Egyptian political scene. "Sing Semsemya", another famous political song was played in memory of El-Captin Ghazali famous musician and poet who documented the resistance years of the Canal trio cities during the war in the 1960s. El-Warsha then drifted to their Tahrir days and celebrated the 2011 revolution in their duet song One Winter Night, sung by Dalia El-Gendi and composer Yasser El-Maghrabi, with lyrics by Shadi Atef. Followed by a monologue of renwoned Performer Shokouko. The grand finale of the night was a song from the 1940s operetta Youm El-Qiyama (Doomsday), El-Warsha’s latest performance. The original operetta lyrics were written by renowned poet Bairam El-Tounsi and sheikh of composers Zakaria Ahmed. "Oh how beautiful the world is,” echoed their voices.